Later this week Williams&Crosby are heading out to Gothenburg in Sweden for the Vitalis 2016 exhibition, the largest eHealth event in Scandinavia, held at The Swedish Exhibition & Congress Centre. 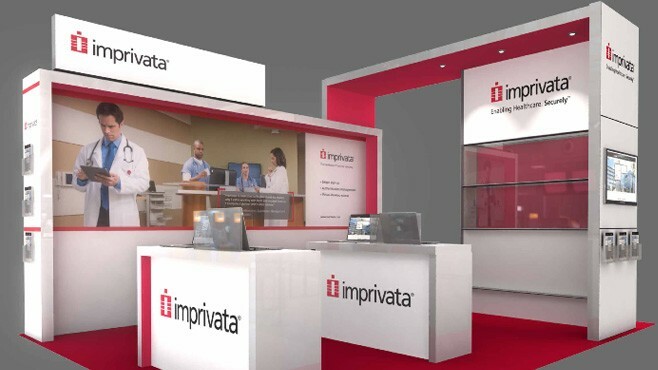 We have designed a stand for our client Imprivata, who provide Healthcare IT & Communication solutions, improving provider productivity for better focus on patient experience. This is the first of a series of exhibitions in something of a "tour" across Europe for Imprivata and their custom built stand. The exhibition is a 3-day event from the 5-7th April, with a 2-day build period required beforehand. So, in order to make sure everything is on schedule and runs smoothly, later this week our director Ed is bravely sailing off on a 37-hour freight ferry crossing to Sweden with all the necessary equipment in tow... thankfully he doesn't suffer from seasickness! He will be there for the run up to the event, the exhibition itself and for the clear up afterwards; ensuring the event is a success every step of the way. The stand that we have designed for Imprivata is a 5x4m modular system. In creating this modular design, we can optimize our client's investment in their stand, as it can be configured to fit various sized spaces for not just this one, but for many future exhibitions. Just some of the many stunning features include; integrated plasma screens, storage units, large back illuminated seamless graphic panels, bespoke demo desks, display cabinets and overhead canopy with lighting. Reading all of that you might think it leaves a lot of work to be done for the installation, but at Williams&Crosby we don't just provide all the parts and leave you with an instruction book and an Allen key to get on with it yourselves! We provide a full turnkey solution, meaning we liaise with the event organisers and plan out everything from the electrics to the flooring. We deliver, build and dress the stand and once the event is over we break down, pack and deliver to storage ready for your next event. What we provide is a truly hassle-free service, taking away any stress from the client and leaving them free to focus on their event and what they do best.